For the record, sushi and I are NOT friends. I love the idea of picking up Sushi and hanging out watching TV with friends, BUT I hate it. I try it and gag. Seafood of ANY kind and I just don’t mix. Okay, I take that back, I am recently learning I do love tuna with avocado, Asian Fish Tacos, and Tilapia Veracruz. Who knows, one day I may decide I like real sushi too, but still not there yet! But Chocolate Peanut Butter Banana “Sushi” and I–well that is a totally different story! Sub out fish, seaweed, and rice for banana, peanut butter and crisp rice cereal and this girl is in heaven! As much as I hate seafood, I LOVE banana and peanut butter together. I could eat Peanut Butter Banana Oatmeal every morning and snack on Peanut Butter Banana Muffins every afternoon. 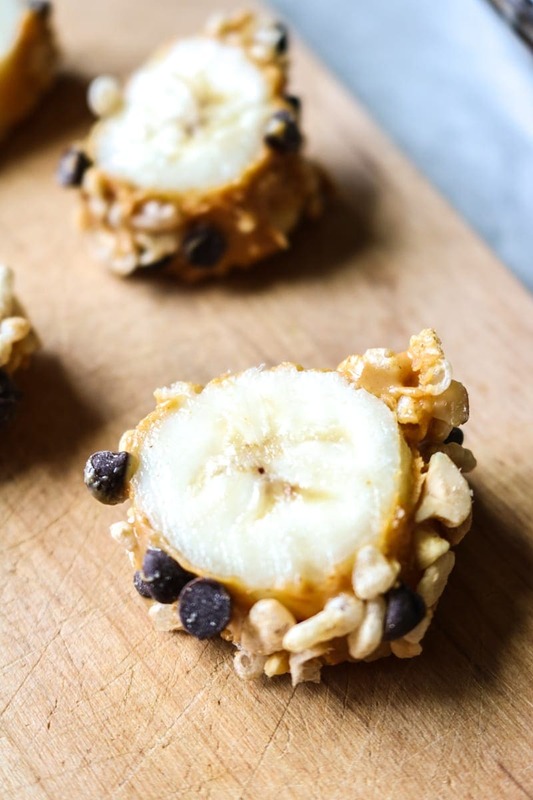 Add chocolate into the mix–well–come on, EVERYONE wants to get on this snack train! I would happily finish every day with this concoction! What kid would NOT want to come home to this after-school snack? 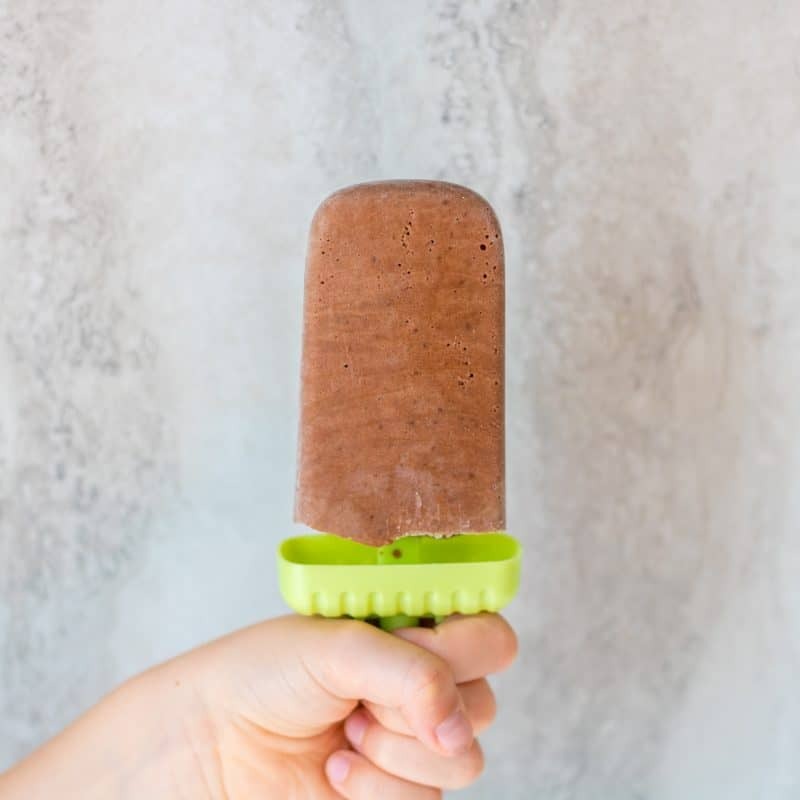 And as a mom–I LOVE that this treat is on the healthier side too–just a few mini chocolate chips thrown in for good measure! 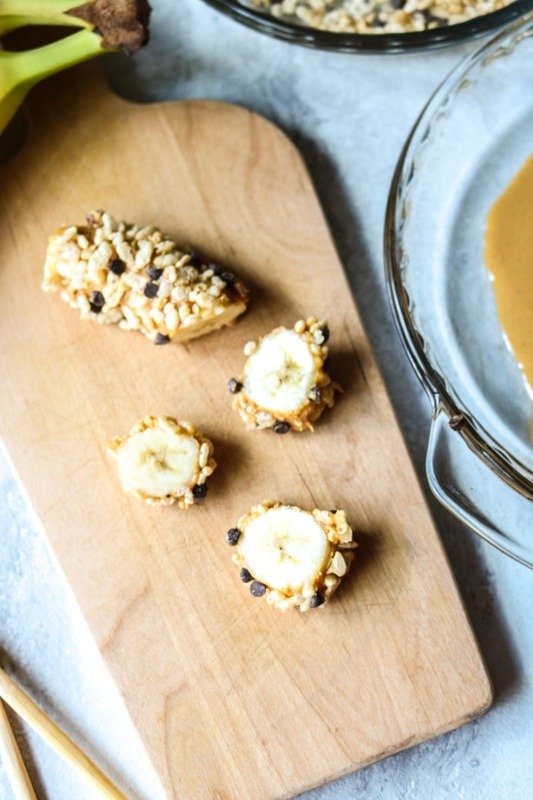 Dip the bananas in almond butter or sunflower seed butter and leave out the crushed peanuts if you prefer to avoid peanuts. 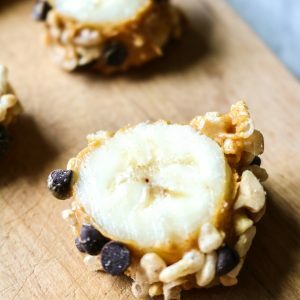 Obviously the chocolate chips are optiona in this banana sushi–although, I think your kids would prefer you to leave them on! It is important to use bananas that are just ripe or slightly under ripe for banana sushi, so the banana is firm enough to roll in the peanut butter without falling apart. Get creative with this banana sushi. Roll in crushed pistachios, almonds, or crushed up candies like M&Ms or toffee bars. The options for banana sushi are endless. Leftover banana sushi? Freeze slices of banana sushi for a frozen sweet treat. Make the kids (and adults) happy and serve up this fun spin on sushi. 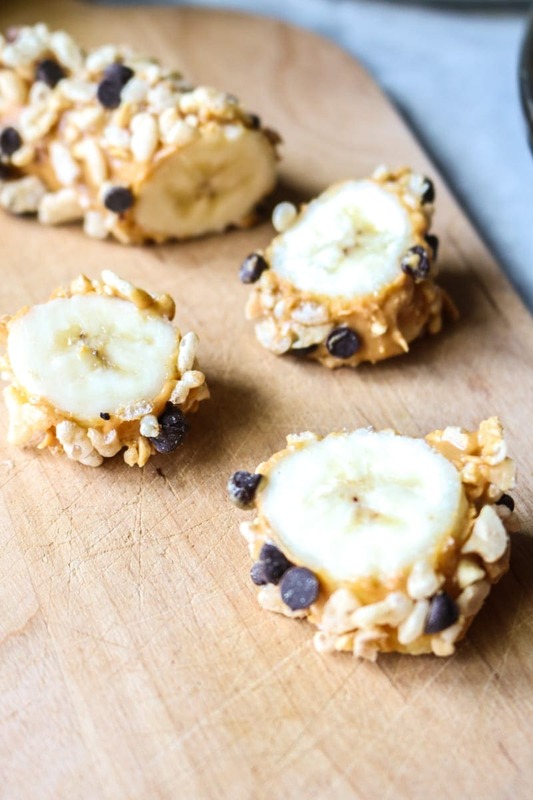 An easy, no bake healthy treat made by rolling a banana in peanut butter then crushed nuts, rice cereal and chocolate chips. In a shallow dish, heat up peanut butter for 30 seconds to become easier to spread. In another shallow dish combine cereal, chocolate chips, and nuts. Dip each banana into the peanut and coat fully, using a spoon if necessary to spread peanut butter over banana. Coat the banana with the cereal mixture. Transfer the banana to a plate and allow to set up in the fridge for 20 minutes or freezer for 5 minutes before slicing into 1 to 2 inch slices and serving. I love this! Perfect for afternoon tea! Ahh I love sushi, but I love this, too!! It makes the perfect dessert after a sushi night or a fun “sushi” for kids who want to be like the grownups, but aren’t quite ready for fish! Exactly! Glad you enjoyed Sue! These are beyond adorable and delicious! We added some coconut too! So good! Oh what a great idea Marjory to add coconut! Do you know if these would last overnight? Hi Erin! The banana will get a bit brown and mushy, so best if eaten ASAP. Sorry.